Winter time is coming, pack your luggage and take a tour to tropical countries. You might need to find hotel accommodation for this trip. We – ThimPress also has an idea to release a new item at this moment. It is a special occasion to introduce WordPress hotel theme with online reservation system – Sailing. Let’s see what do We have in this WP template. Sailing is a special design to make a clean, amazing and high functionality website for hotel, resort, villas, spa and other similar businesses. I am so sure that you will be surprised to see such a great hotel theme! The online reservation system is the most important part of a hotel WP theme premium where allows visitors to browse room availability and make the room booking. ThimPress stays on the role of web users to develop its powerful plugin – TP hotel booking to manage the system. From here, you will have full control over the room, bookings, pricing, customers, coupons, plans, etc. Sailing WP hotel theme is designed responsively with four pre-made attractive demos and Retina ready. Pages are built on the SEO standards to help search engines and customers easily find your website. These elements are really important to make your hotel website stand out of the crowd. More than that, the Home page features Revolution Slider with $18 saving. The amazing “Gallery,” elegant rooms catalog and “About us” pages include all necessary information to boost your web page. The SiteOrigin is integrated into this hotel WordPress theme to simplify building posts, pages of your hotel website. 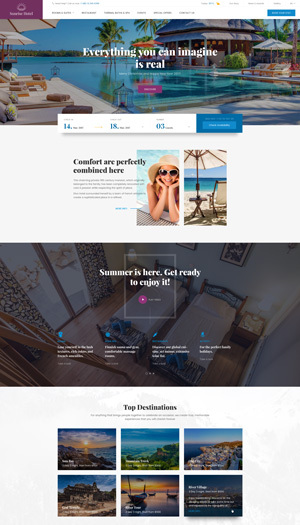 Furthermore, the WordPress Hotel Theme Sailing supports other plugins such as ThimPress Testimonials to show off your testimonials, Black Studio TinyMCE Widget to add a new “Visual Editor.” Marketing plays an important role to have successful accommodation services. Therefore, the responsive WP theme for a hotel – Sailing integrates with social media sharing feature to share information, introduce your hotel website via Facebook, Twitter, Instagram, G+ and many famous social media sites of the world. Besides the tasteful design and functionality for hotel, resort, spa, guest house … etc. then Sailing also can be an online shop where you can set up products, features, price,… by Woocommerce. Especially, this WordPress Hotel Theme also supports translation ready (.po/.mo file), RTL and provides unlimited editable options as unlimited color choices, 600+ Google Fonts. With those mentioned features, it is more or less to convince you that WordPress Hotel Theme – Sailing is the best. If you want to know more information, please come and see our performances here. Sailing is proud to be listed as one of best WordPress Hotel Themes. i like your blog. i have not come across such a blog on internet. i like the information on your weblog. i will bookmark it. i will come back for updates.